Legislative leaders say Governor Doyle&apos;s budget shows just how hard it will be to close a $5.7 billion deficit. Assembly Speaker Mike Sheridan (D-Janesville) says some of the proposals will require a closer look and the "devil&apos;s in the details" that will be examined in the coming months. Senate Majority Leader Russ Decker (D-Schofield) says the governor should be able to get most of what he wants. However, Decker says some proposals, such as a statewide smoking ban, may require a little more work than others. Decker has advocated a smoking ban that includes a phase-in period for taverns. 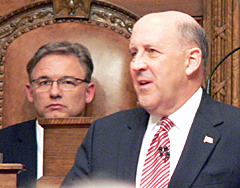 Doyle&apos;s proposal would have it take effect statewide two months after the budget is approved. Both Sheridan and Decker are unsure if they&apos;ll support a proposed 75 cent hike in the cigarette tax. Decker says it may be a little higher than he&apos;d prefer. Sheridan says he hasn&apos;t made a final decision yet on if it&apos;s the right number. Decker says a proposal to close several DMV and DOT service centers is worth considering as part of efforts to reduce state government where we can.